Matt Owens is a Pulitzer Prize nominated journalist, but at 35 he's adrift, more inclined to hit the bottle alone than the Miami Beach club scene. But when his beloved younger sister Mandy comes to visit, Matt wants to show her a new world. It's the trip of her dreams, but the nightmare begins when Mandy disappears from a crowded dance floor. When her lifeless body is found, one clue—a grisly rock song downloaded onto her iPod—may be the calling card of a serial killer. Shattered with grief and guilt, Matt vows to find Mandy's killer, following a chain of musical clues that lead him from an abandoned London rock club to a crumbling Scottish castle and finally to the ancient bone-strewn catacombs below Paris. Only one person believes in his quest—Eve Bellamont, a dedicated French detective whose own five-year obsession to find the same killer has made her an outcast in her own department. Together, they race to decipher the "killing songs" that the madman leaves with each victim and stop him before another beautiful young woman dies. "Tense, thrilling...you're going to bite your nails!" "I loved The Killing Song, in which the best sister act in crime fiction, known as P.J. Parrish, has crafted one of the best criminals ever. Their serial killer is as brilliant as he is ruthless, but he makes a critical mistake when he murders the baby sister of reporter Matt Owens. Heartbroken and driven, Matt tracks the villain from Miami's South Beach to the catacombs of Paris, in a story so riveting you won't be able to stop turning the pages." "A wonderful standalone serial killer novel, cleverly using songs and music as clues, taking you all over the globe and winding up in the ultra creepy Paris sewers." "Truly original, with a killer that will make your skin crawl and keep you on the edge of your seat until the very end. This is a great book for fans of Thomas Harris or Chelsea Cain, but anyone who enjoys a good thriller will love The Killing Song!" "A complex, sophisticated mystery, it is enormously well written with lines and phrases that will keep coming back to you. This is a guaranteed can't put down book that absorbed me as much as The Girl With Dragon Tattoo." "Despite the deep emotional elements, Parrish keeps the reader's feet to the fire with unrelenting tension. While the graphic murder scenes will bring on chills, the true artillery lies in the detailed insight into the killer's twisted mind as he performs his murders with the same concentration he brings to his music. You may never view classical music the same way again." "Wrapped in the tenets of a serial killer novel, P.J. 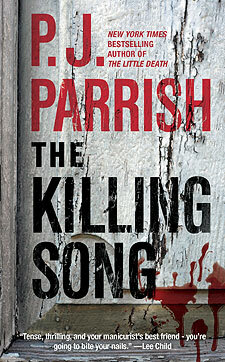 Parrish's first stand-alone novel works well as an intense thriller and as a coming of age novel. With much of the action taking place in Paris, The Killing Song also is an inside view of the neighborhoods and the sewers and catacombs beneath of The City of Light. The frenetic pace barely gives the reader time to breathe in this high-octane plot. Matt and Eve's instincts take them to Scotland and London and various parts of Paris, including a deliciously creepy tour of the catacombs. Along the way, Matt's need for justice and vengeance also allows him to see his life with clarity. The platonic friendship of Matt and Eve based on the need to find the killer gives each a solid foundation from which they both can grow emotionally. The scenes with the killer, an international musical prodigy, add to the psychological suspense. Parrish skillfully illustrates his motivation, while at the same time never making him a sympathetic character." "A spine-chilling thriller that will keep you up late into the night. With twists and turns, a cold-blooded killer with a long and bloody past and complex and engrossing characters, The Killing Song will keep you on the-edge-of-your-seat and your heart pumping." "Fast-paced suspense and creepy villain." "If you enjoy a good travelogue with your thrills and chills, this is one you won't want to miss!"